Lobotomy, stereotactic surgery or, as it has become renamed in more recent years, ‘neurosurgery for mental disorder’ (NMD). Whatever the name, it is the practice of cutting out – or otherwise destroying healthy tissue of the brain, in the mistaken belief this will somehow cure a patient. With ECT and psychosurgery continually under public scrutiny, psychiatrists are always searching for new “miracle breakthroughs” for treatment of the brain. In the past few years we have seen Deep Brain Stimulation (DBS, Transcranial Magnetic Stimulation (TMS) and Vagus Nerve Stimulation (VNS). 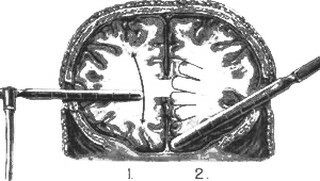 DBS involves threading wires through the skull and into the brain. These wires connect to a battery pack implanted in the chest, similar to that of a heart pacemaker. High frequency electrical impulses emanate directly into the head. Although originally approved for Parkinson’s disease, an actual medical brain-based pathology, psychiatrists are experimenting with this procedure on their mentally traumatised patients. – Samuel K. Moore “Electronic Antidepressant Up for Review” Spectrum Online 9 June 2004 and Mark S. George, “Stimulating the Brain,” Scientific American, September 2003. In TMS, a magnetic coil is placed near the patient’s scalp and a powerful and rapidly changing magnetic field passes through skin and bone and penetrates a few centimetres into the outer cortex (outer grey matter) of the brain and induces an electrical current. Repetitive TMS can cause seizures or epileptic convulsions in healthy subjects, depending upon the intensity, frequency and duration of the magnetic stimuli. – Samuel K. Moore “Electronic Antidepressant Up for Review” Spectrum Online 9 June 2004 and Mark S. George, “Stimulating the Brain,” Scientific American, September 2003. VNS is a nerve-brain stimulator. An electrode is wrapped around the vagus nerve in the back of the neck then connected to a pacemaker implanted in the patient’s chest wall. The apparatus is programmed to produce electrical stimuli in the brain. – Samuel K. Moore “Electronic Antidepressant Up for Review” Spectrum Online 9 June 2004 and Mark S. George, “Stimulating the Brain,” Scientific American, September 2003. It is little wonder, with a fixation on treating the brain, rather than treating the ‘soul’ using scalpels, electricity and drugs, that psychiatrists have not been able to advance a cure for their patients, in over 100 years.